While a paediatric dosage has not been defined, posaconazole is occasionally being used in children. We conducted a multicentre retrospective survey and identified 15 patients (median age 10 years [range 3.6–17.5]) who received posaconazole salvage therapy for proven (9 patients) or probable (6 patients) invasive fungal infections. Posaconazole was administered for a median of 32 days (range 4–262) at a median dosage of 21 mg/kg (range 4.8–33.3). None of the patients discontinued therapy due to adverse events, which were mostly mild and observed in 11 patients. Complete or partial responses were observed in 4/7 patients with zygomycosis, 3/4 patients with invasive mould infection, 1/2 patients with invasive aspergillosis and 1/2 patients with chronic disseminated candidiasis. 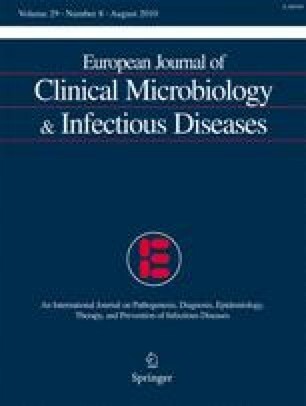 We conclude from the data that posaconazole displays favourable safety and tolerance and may be useful for management of individual paediatric patients with invasive infections. The results of this survey were presented in part at the 48th Interscience Conference on Antimicrobial Agents and Chemotherapy, Washington, DC, 2008, and at Trends in Medical Mycology 4, Athens, Greece, 2009. TL has received grants from Gilead; he is a consultant to Gilead, Merck, Sharp & Dohme and Schering-Plough, and served at the speakers’ bureau of Astellas, Gilead, Merck, Sharp & Dohme and Schering-Plough. AHG has received grants from Gilead and Merck, Sharp & Dohme; he is a consultant to Astellas, Gilead, Merck, Sharp & Dohme and Schering-Plough, and has served at the speakers’ bureau of Astellas, Gilead, Merck, Sharp & Dohme, Pfizer, Schering-Plough and Zeneus/Cephalon. All other authors have nothing to declare. National Cancer Institution (NCI) Common Toxicity Criteria version 3.0 (2006) Common terminology criteria for adverse events v3.0 (CTCAE). Available at http://ctep.cancer.gov/protocolDevelopment/electronic_applications/docs/ctcaev3.pdf. Accessed October 12, 2009.